Next Thing Co.'s C.H.I.P. is positioned as cheap ($9) competitor to the wildly successful Raspberry Pi, featuring a 1GHz ARMv7 processor, 512MB of RAM, and Wi-Fi/Bluetooth built-in. I recently got ahold of one and its not-as-cheap ($60) Pocket case. Once you slot your C.H.I.P. 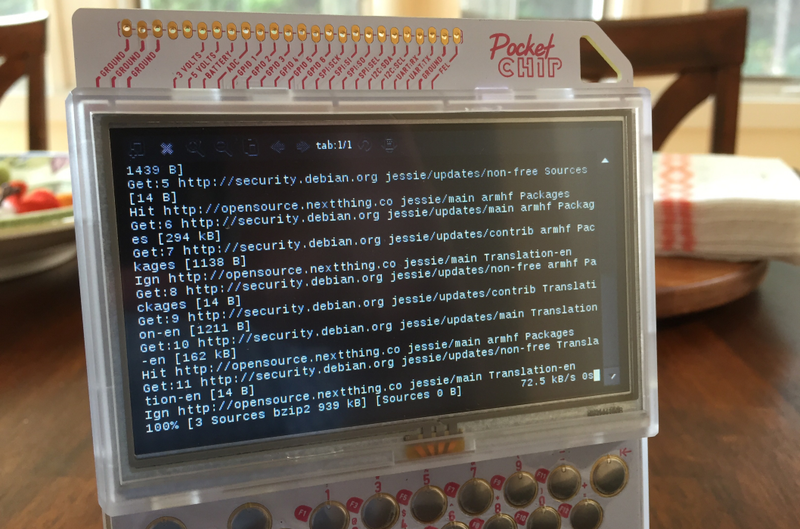 in to the Pocket, you get access to a lithium polymer battery, a 480x272 touchscreen, keyboard, and easily-accessible GPIO headers. 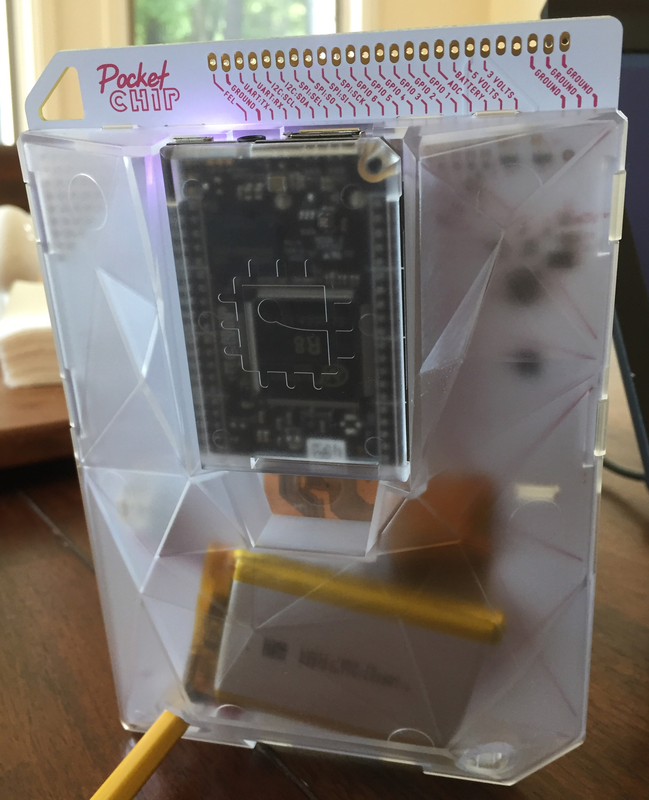 Here's a quick look at the hardware and what you can actually do with it! The front of the Pocket has extended headers for all of the C.H.I.P. 's GPIO ports, making it easy to wire up new hardware. For example, the Pocket doesn't have a speaker built-in, but it's pretty easy to add one. The screen isn't high resolution (480x272), but it's big, bright, and easy to read. There's a resistive touch screen over the LCD panel, so you can use your fingers or any other blunt object to tap icons and controls. This makes it much easier to navigate! Moving a bit farther down, we've got a keyboard with some special extra keys to make gaming easier, a dedicated power/home button, and holes to make a stand out of a pen or pencil. There are no screws on the Pocket, so you can take it apart if you want! There are some extra prototyping traces in the upper left corner you can use if you're adding a new internal component. The C.H.I.P. itself is removable, but be careful -- it's slotted pretty tightly in to the Pocket's connectors. If you want to use the C.H.I.P. for something else, it needs to be re-flashed; the one that comes with the Pocket is running special software to drive the touchscreen and that nifty app launcher. Digging around a bit more, you'll notice a 3000mAh LiPo battery pack. NTC says it's good for about five hours, though I've been able to squeeze more out of it by lowering the screen brightness and turning off WiFi/Bluetooth. The C.H.I.P. 's power circuitry handles charging the Pocket's battery, so don't charge the battery directly unless you know what you're doing. Lithium batteries can be dangerous, and any cell phone charger that puts out at least 1.5 amps at 5 volts will work fine. One of the built-in apps is a standard terminal running the bash shell. The C.H.I.P. runs on an ARMv7 version of Debian Jessie (8.5), so you can install pretty much anything you like. I've been using my Pocket to do network analysis with nmap. The Pocket's biggest claim to fame? 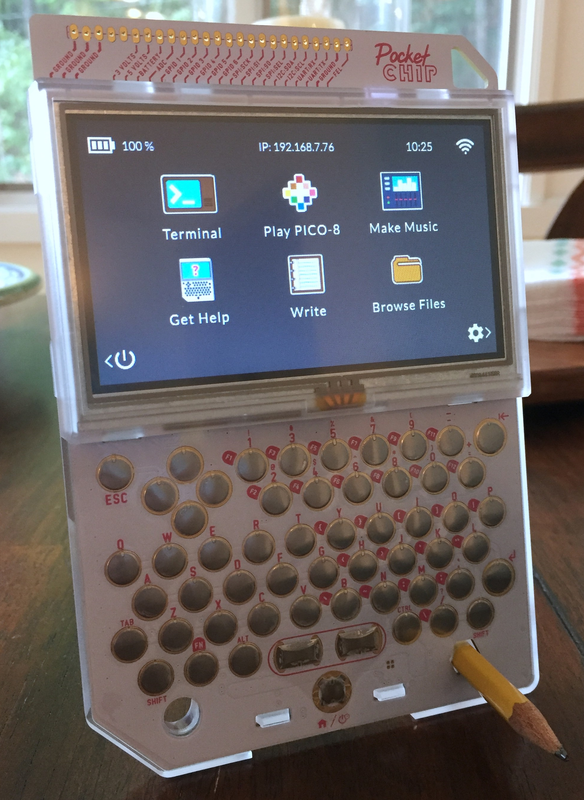 It runs the PICO-8 fantasy console, a "fake" gaming console done up in software. 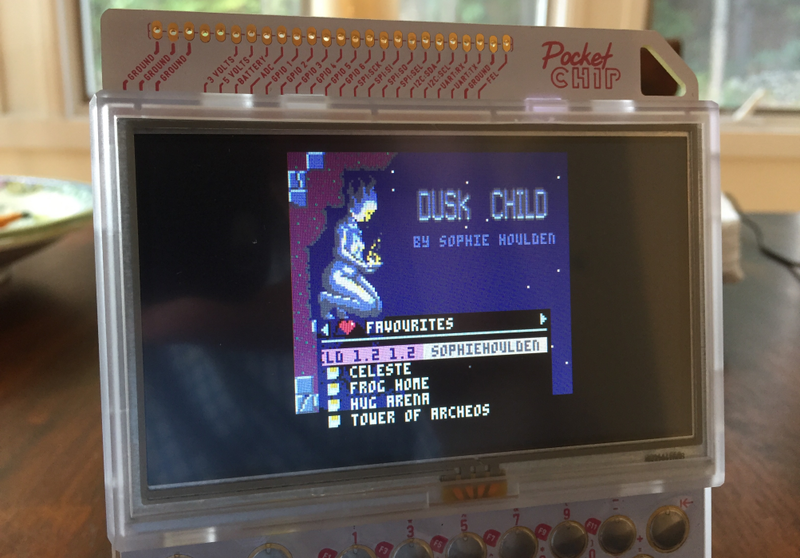 The PICO-8 suite has loads of fan-developed games available that are all editable on-device. Feel like editing the sprites? Go for it. Audio? You're covered. Maps? There's something for that too! It's a really interesting concept, one that I hadn't heard of until the Pocket came along. Now, I'm slowly working my way through top games list, trying new titles out. 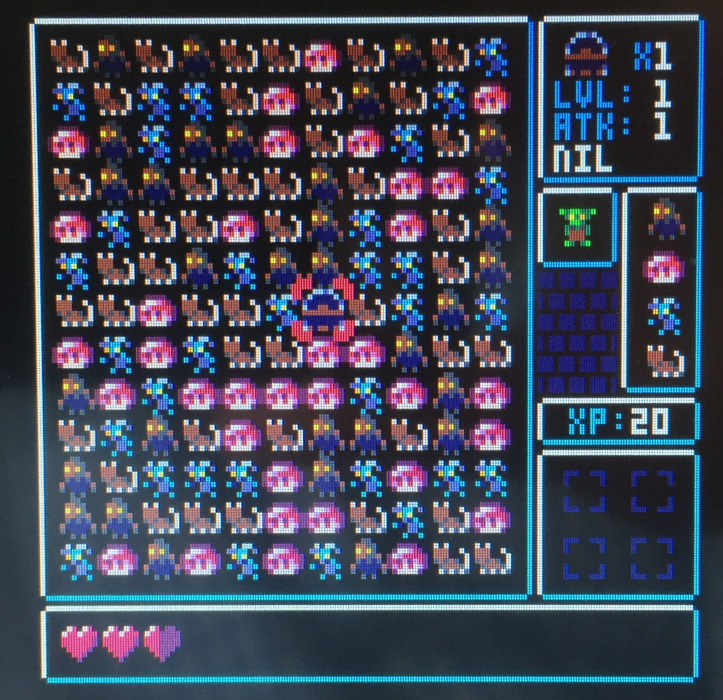 One of my favorites so far is Tower Of Archeos (shown below), a puzzle RPG where you have to balance defeating foes with collecting useful items and keeping your hearts topped off. I have a software-defined radio project in the works that I'm going to try to leverage the Pocket for. In the meantime, do you have a C.H.I.P. or a Pocket? If so, let us know what you think in the comments!